Japanese is one of my favourite cuisines. There are plenty of Japanese restaurants around that serve sushi, but the one thing Alberta needs more of is Japanese izakayas. Edmonton is lucky to have Izakaya Tomo, but I wish there were more casual options for post-work drinks and tapas. This is why I was really excited when I heard Hapa Izakaya was opening its first Alberta location in Calgary. 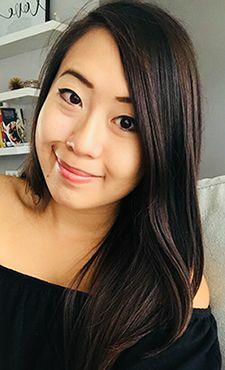 On one of my recent trips to Calgary I finally had the chance to visit Hapa. I had my first taste on a visit to Vancouver years back and couldn't wait to see what menu items they brought over to Alberta. Hapa Izakaya is located downtown on busy 11th Avenue, where parking can be a challenge to find depending on the time of your visit. The space is large with an open concept design and the large windows in the front of the restaurant allow plenty of natural light into the restaurant. Come sundown, the dark decor and dimmed lighting give a more intimate feel. 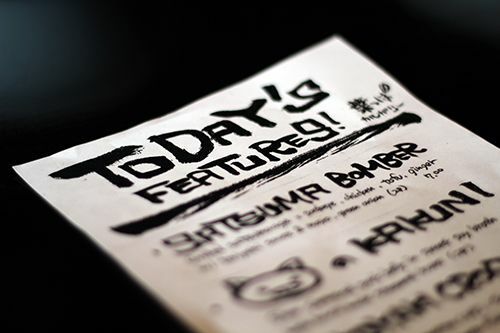 As with many izakayas, there is a regular menu and a fresh sheet outlining daily features. I noticed that the menu seemed to be smaller than that in Vancouver (the menu has expanded since my visit! ), but there was still a fair amount of options to choose from. 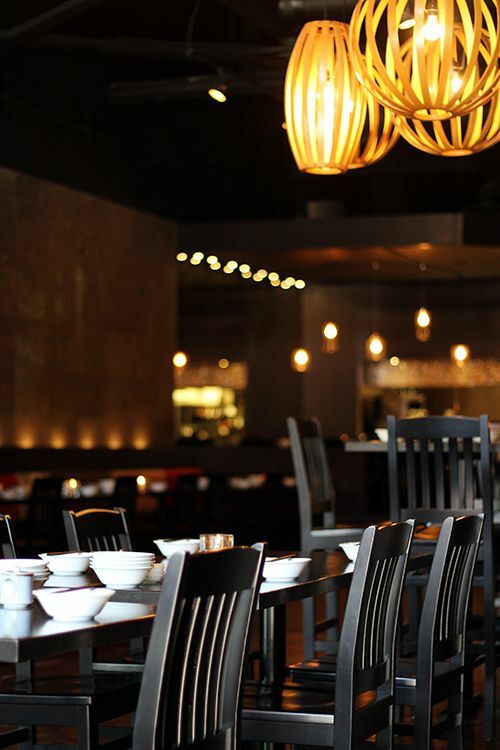 In addition to ordering a la carte off the menu, Hapa offers a 12 course prix fixe menu at $35 per person and has a 'Hapa Hour' menu from 5:30-6:30 pm with certain plates offered at 50% off. Our meal started off with the Bintoro ($12), which is a seared Albacore tuna sashimi in ponzu sauce. The thick cut slices of the lightly seared tuna were so fresh, and I loved the slightly tangy ponzu sauce. The greens, seaweed, and garlic chips were a great accompaniment to the fish. I could eat this tuna all the time. Hapa Izakaya also has a decent selection of sushi rolls, so we went with the Kin Roll ($15) and Umi Roll ($15). The Kin Roll is made with asparagus tempura, onion, miso mayo, yuzu rind, and topped with yellowtail that is torched tableside. The fish is fresh, asparagus still slightly crunchy, and the sweet miso brings all the flavours together. 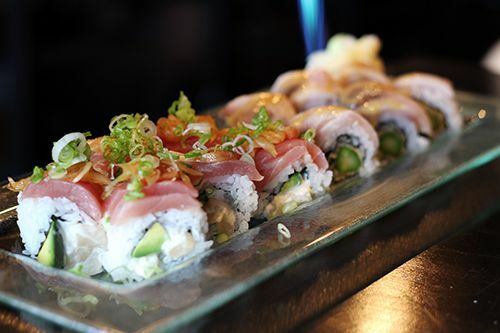 The Umi Roll on the other hand is made with chopped scallops and avocado then topped with Ahi tuna and pickled onion vinaigrette. 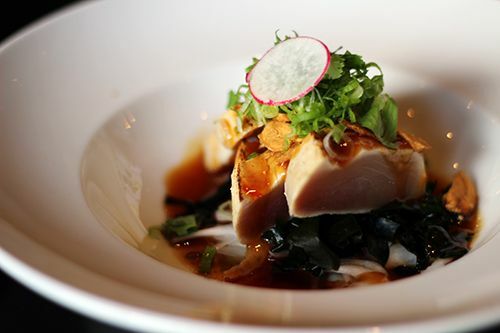 The Ahi tuna carries flavours similar to that of their ponzu sauce. The rest of the roll is less flavourful, but that allows you to taste just how fresh and sweet the raw scallops are. 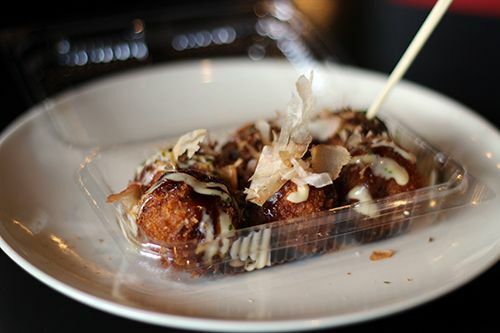 When I visit izakayas, Takoyaki is always at the top of my list of things to order. The Takoyaki ($7.50) at Hapa Izakaya is on the fresh sheet, so unfortunately it isn't always available. However, if you get the chance definitely order it! These crispy balls of octopus in smooth batter are something you don't want to miss. Finishing off our orders was the Spicy Pork Ishi-yaki ($12). 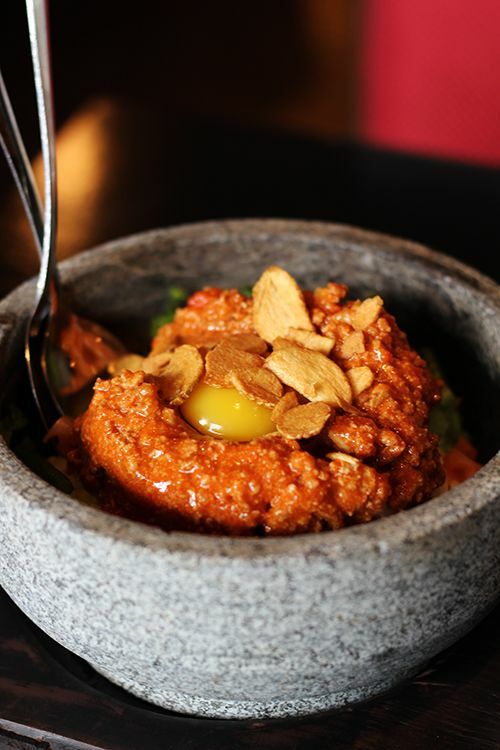 Served in a hot stone bowl, rice is topped with minced pork, garlic sprouts, tomato, lettuce, spicy miso, and a raw egg. Similar to Korean bibimbap, this rice bowl is mixed up table side and allowed to sizzle in the pot. There was plenty of sauce to coat all the ingredients and the crispy rice. I loved the punch of spicy miso and garlic flavours, and it's a bowl of rice that will definitely warm you up on a cold night. Offering something different compared to the traditional Spanish tapas, I'm sure Hapa Izakaya has been happily embraced by those who enjoy going for post-work drinks and small plates. Our server was knowledgeable and attentive, and it was a great upbeat environment to dine in. I'm a little sad that Hapa Izakaya hasn't expanded up to Edmonton, but there's always hope! Oh my, oh my!!! That spicy pork rice bowl looks amazing! I love how the rice at the bottom gets crispy and those sushi rolls looked amazing! Totally need to eat some japanese soon! Wow the pictures are stunning. I haven't been to Hapa in a long time. These dishes looked amazing! I hope they will have a restaurant in Edmonton too. Have a great weekend Andrea!